Sachin Ramesh Tendulkar (Hindi: सचिन रमेश तेंडुलकर; born 24 April 1973), often referred to as The Little Master, is a former Indian cricketer. The only thing that was on my mind was, 'I want to play for India one day,' and I was pretty sure and confident that one day I will. Tendulkar referring to his passion for cricket as a young player. When people throw stones at you, you turn them into milestones. 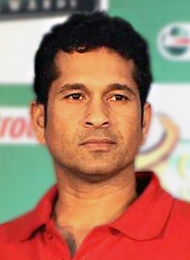 Tendulkar said when interviewed about his retirement, Tendulkar retirement interview. I have never tried to compare myself to anyone else. Sachin cannot play the helicopter shot like Dhoni, hit sixes like Sehwag, play an innings like Dravid or be a captain like Ganguly. But no one can be as good as him in what he does. It's about not accepting every little challange thrown at you. Sometimes you hold back and when it's needed you go for it. Sometimes it is about being patient and not just about grabbing every opportunity that comes our way. I have never thought where i will go, or forced any targets on myself. When there is time to think about i think,but when there is time to be with family , i try to do justice to that aspect of my life as well. Don't stop chasing your dreams, because dreams comes true. Whatever level you reach, getting better, never stops. Go out there and outdo your achievements. Getting better never stops. I fail sometimes, I succeed sometimes, so that's fair enough. It's a package deal. It comes with that package:Failures and sucess. The art of positive thinking. In any profession,there are always ups and downs. There will always be twists and turns in our lives. In my several years of international cricket, Tendulkar remains the best batsman I have ever bowled to. It's been a pleasure to bowl at the master batsman even though one hasn't always emerged with credit from the engagements. Sachin Tendulkar has often reminded me of a veteran army colonel who has many medals on his chest to show how he has conquered bowlers all over the world. I have delayed my shoots many times to watch Sachin bat. Sachin Tendulkar means more to India than I do. When you bowl at him you are not just trying to get him out, you are trying to impress him. "I want him to walk off thinking 'that Flintoff, he's all right isn't he? I feel privileged to have played against him. To Sachin, the man we all want to be. There are two kinds of batsmen in the world. One, Sachin Tendulkar. Two, all the others. I am fortunate that I've to bowl at him only in the nets. I can be hundred per cent sure that Sachin will not play for a minute longer when he is not enjoying himself. He is still so eager to go out there and play. He will play as long as he feels he can play. You get him out and half the battle is won. I don’t know cricket, I don’t know how Sachin plays. But I still try to watch him playing because I want to know why my country’s economy goes down 0.5% when he’s batting. The thing I admire most about this man is his poise. The way he moves, elegantly without ever looking out of place in any condition or company, suggests his pedigree. I have to say Sachin (is better than Lara), because he has that aura when he comes out to bat. You might pitch a ball on the off stump and think you have bowled a good ball and he walks across and hits it for two behind midwicket. His bat looks so heavy but he just waves it around like it's a toothpick. You know genius when you see it, and let me tell you, Sachin is pure genius. The only batsman I would love to see by paying for the tickets and sitting in the stand just to watch him is none other than Sachin Tendulkar. Tendulkar is to cricket what Michael Jordan is to basketball and Muhammad Ali to boxing. Beneath the helmet, under that unruly curly hair, inside the cranium, there is something we don’t know, something beyond scientific measure. Something that allows him to soar, to roam a territory of sport that, forget us, even those who are gifted enough to play alongside him cannot even fathom. When he goes out to bat, people switch on their television sets and switch off their lives. He has been in form longer than some of our guys have been alive. Sachin Tendulkar, the Little Master, is so talented that wherever you’re from, you can’t help but admire him as he hits another century. Putting Sachin Tendulkar's latest feat in a strictly cricketing context would not be fair to the sportsman. His achievements in the world of cricket need to be seen on a par with efforts in any other field - science, art, literature, etc - to push the frontiers of human excellence. I actually feel very embarrassed because I rejected him as a fast bowler. I think I did him and the game of cricket a favour. If I’ve to bowl to Sachin, I’ll bowl with my helmet on. He hits the ball so hard. I saw him playing on television and was struck by his technique, so I asked my wife to come look at him. Now I never saw myself play, but I felt that this player is playing with a style similar to mine, and she looked at him on Television and said yes, there is a similarity between the two...his compactness, technique, stroke production... it all seemed to gel! In the early years, especially around the mid 90s, I had this feeling you could play around on his ego and get him out. He believed he could attack bowlers at any time and anyone who could bowl maidens to him stood a good chance. Things are of course different now. I am one of those fortune people who have seen Bradman and Tendulkar bat in my lifetime and in my opinion Tendulkar is the best batsman I have seen in my life. I had to remind Gary Kristen often that he was in the covers to field against Sachin and not to applaud him. Nothing bad can happen to us if we’re on a plane in India with Sachin Tendulkar on it. It did dawn on me at the end of the series that he was something special. I know that the new ball is due, but I am saving it for that "Chotu" (Sachin) who is coming next. Imran Khan (captain) of Pakistan to Javed Miandad (vice captain) in Sachin's debut test series (1989). There is no doubt he is the greatest batsman. In the last 13-14 years, he has worked so hard and has proved to the world he is outstanding and when he is playing so well, you can only wait to get his wicket. He is just a legend of the game. To score 20 or even 30 Test hundreds would represent a magnificent career, but to go on and score 50 is remarkable. He has set the benchmark for other batsmen to follow, but the truth is it is hard to see how anyone can truly follow him because he is moving the bar so high. It is not simply about ability where Sachin is concerned, it is about longevity, fitness, and hard work. And to cap it all he is such a gentleman. I watch him bat and sometimes I wonder how he makes it look so easy. He has an unbelievable gift and he has made the most of it and long may he continue. I’m lucky to have been able to get to know him. When we were growing up, we all used to watch Sachin. He was like God to us, he had that aura around him. We did not lose to a team called India, we lost to a man called Sachin. Irrespective of the score, whenever Sachin Tendulkar comes to bat he is under pressure. The pressure comes from all those people who look up to him, who pray that he gets a century, who cheer like India has already won when he comes in to bat, and who silently troop out of the stands once he gets out. When a visiting team comes to India, they know whom the Indians look up to. While they love watching India play, there is no doubt that Tendulkar is the player they love watching most. There is a buzz when he comes in to bat and if he fails, the crowd goes quiet for the rest of the game. I have seen God, he bats at no. 4 for India. This little prick's going to get more runs than you, AB. Test cricket is bloody hard work, especially when you've got Sachin batting with what looks like a three-metre-wide bat. Don't bowl him bad balls, he hits the good ones for fours. The more I see him, the more I want to see him. The more I see of him the more confused I'm getting to which is his best knock. His mind is like a computer. He stores data on bowlers and knows where they are going to pitch the ball. On a train from Shimla to Delhi, there was a halt at one of the stations. The train stopped by for few minutes as usual. Sachin was nearing a century, batting on 98. The passengers, railway officials, everyone on the train waited for Sachin to complete the century. This genius can stop time in India! We didn't see at that time and you cannot visualise 20 years down the track what the player is likely to do in the context of the history of the game. When you score as many runs as he (Tendulkar) has in Test and one-day cricket and score as many centuries and half centuries as he has done, it makes him arguably the greatest player ever in the history of the game. Statistics speak volumes of his contribution to Indian and world cricket. He is a phenomenal player. I would like to thank you from the bottom of my heart for allowing us to breathe the same air as you do. Sachin Tendulkar is, in my time, the best player without doubt - daylight second, Brian Lara third. With Sachin Tendulkar and Brian Lara, it was better to be friends and make them smile rather than wind them up. I don’t think anyone, apart from Don Bradman, is in the same class as Sachin Tendulkar. There is no shame losing to such a great player. India's fortune will depend on how many runs the little champion scores. There is no doubt Tendulkar is the real thing. We have had champions, we have had legends, but we have never had another Sachin Tendulkar and we never will. In cricket, my superhero is Sachin Tendulkar. He has always been my hero and will continue to remain so. Tendulkar has carried the burden of the nation for 21 years. It is time we carried him on our shoulders. I didn’t see Don but to me, in all my years associated with the game, I haven’t seen a better batsman than Sachin Tendulkar. I think he is marvellous. I think he will fit in whatever category of cricket that has been played or will be played, from the first ball that has ever been bowled to the last ball that’s going to be. He can play in any era and at any level. I would say he’s 99.5% perfect. Certainly the best I’ve seen... People talk of (Sir Don) Bradman, but our generation and the ones immediately before us didn’t get to see him... Sure, he has an astounding average (99.94), but of the cricketers I’ve watched, Sachin’s the best. I have no doubt in my mind that he was the greatest batsman of the modern era and I don`t see another like him coming soon. It was a privilege to play against him. He is definitely someone who is miles ahead of his competition. In our days, cricket was played less, but in Sachin’s time, there is relentless pressure to perform. And the way he has carried on batting throughout his career is phenomenal. As for myself, I have many videos of Sachin’s best innings which I will watch from time to time to reminisce about his batting achievements when he has retired. This page was last edited on 20 March 2018, at 09:41.